The parodies covered in this section are primarily from publishers other than DC. From Super-Soldier: Man of War #1 (1997). Art by Dave Gibbons. In 1997, DC and Marvel co-published comics under the banner of Amalgam. In these books, individual characters from both universes are merged into one new character. The All-Star Winners Squad appeared only in theSuper-Soldier: Man of War one-shot. There was another Golden Age Amalgam group called the Young Commandos (Boy Commandos + Young Allies). They were led by "Brooklyn" Barnes and appeared in Spider-Boy #1. The Freedom Brigade. From Showcase #65 (1966); art by Joe Orlando and Mike Esposito. The Freedom Brigade appeared only twice. In the first story, they coaxed their offspring to band together as the "Inferior Five." In the second, they served as teachers at Dean Egghead's Academy for Superheroes (a parody of Marvel Comics' Professor X and the X-Men). The Invaders were a Silver Age creation, and not parodies per se. Its members were not based upon DC's Justice Society, but Roy Thomas is a legendary JSA fan, and he created the Invaders by assembling heroes who'd been published ? but not teamed ? during the 1940s (by Marvel's predecessor, Timely). Thomas would later use this same approach to expand upon DC's wartime characters, in All-Star Squadron. Their original membership included: Captain America and Bucky, the Human Torch and Toro, and Namor the Sub-Mariner. Later, in their own series, they added more members: Union Jack, Spitfire, Miss America, Whizzer, Blazing Skull and Silver Scorpion. The Knights of Justice were unquestionably inspired by the JSA. Big Bang Comics specializes in printing nostalgic comics and many of their characters are based on DC and Golden Age archetypes. The Knights hailed from Earth B, while their younger successors, the Round Table of America (based on the Justice League), were from Earth A. Both teams first appeared in Big Bang Comics v.1 #3 (Caliber Press) and their origin can be found in Big Bang Comics v.2 #4 (Sept. 1996). #24 and 26 are a staggeringly detailed mockery called "History of Big Bang Comics" that tells about these characters' faux publishing histories. The Knights were said to have originally appeared in the Golden Age "World Class Comics." In the 1960s, the Knights of Earth-B disbanded and a new group called the National Guardians was formed. Big Bang #32 featured a story on the soon-to-be-released "Knights of Justice" television show. Real life models were posed for group pictures as Ultiman, Knight Watchman, Thunder Girl and Masker (Black Canary). Other features of the groups included Big Bang Comics v.2 #6, 12, 14, 24, 32, 33 and 35. From Doctor Star and the Kingdom of Lost Tomorrows #1 (2018); art by Max Fiumara. Black Siren, Tom Turbine, the Streak, Green Guardsman, Catman. From Justice League Season 1, Episode 16: "Legends," part 1 (2002). In Justice League Season 1, Episodes 16–17 (21 and 28 April 2002), the Justice League met a group of five heroes called the Justice Guild of America when they were accidentally transported to a parallel world. These people were familiar to the JLA — as comic book characters on the Justice League's world. Note: The episode is dedicated to Gardner Fox, a Golden Age writer who co-created both the Justice Society and the Justice League, upon whom the Guild are based. In the end, the JLA learns that the entire reality was a fabrication made by the illusion powers of the JGA's mascot, Ray Thompson (similar to Snapper Carr). At one time, there had been a JGA, but they died battling a global catastrophe. The JLA frees that world's survivors from the illusion and returns home, leaving them to rebuild. The first call of the newly expanded Justice League. From Justice League Unlimited Season 1, Episode 1: "Initiation" (2004). Episode 1 ("Initiation,"	31 July 2004). The League expands their operations, enlisting new recruits across the globe. JSA characters in attendance include: Atom-Smasher, Crimson Avenger, Dr. Fate, Dr. Mid-Nite, Hourman, Johnny Thunder and Thunderbolt, Huntress, Mister Terrific, Obsidian, Sandy, Stargirl, Shining Knight, S.T.R.I.P.E., Vigilante, and Wildcat. Episode 6 ("Fearful Symmetry,"	4 Sept. 2004). Supergirl meets her clone, Galatea, whose look is styled on Power Girl. Episode 8 ("The Return," 18 Sept. 2004). Dr. Fate helps the Atom against Professor Ivo and Amazo. Episode 11 ("Wake the Dead," 18 Dec. 2004). Dr. Fate, Aquaman, and Hawkgirl versus Solomon Grundy. Episode 1 ("The Cat and the Canary," 5 Feb. 2005). Black Canary saves her mentor, Wildcat from an underground fight club. Episode 2 ("Shadow of the Hawk," 17 Sept. 2005). Hawkgirl meets Carter Hall, an archaeologist who has discovered Thanagarian artifacts from ancient Egypt. Episode	3 ("Chaos at the Earth's Core,"	24 Sept. 2005). Supergirl, Stargirl, S.T.R.I.P.E., and Green Lantern help the Warlord liberate the hidden land of Skartaris. Episode 7 ("Patriot Act," 25 Feb. 2006) featured a new grouping of heroes that mirrored the original Seven Soldiers of Victory. With the most powerful League members busy, Green Arrow leads Stargirl, S.T.R.I.P.E., Shining Knight, Crimson Avenger, Vigilante, and Speedy against General Wade Eiling, who had transformed from ingesting a super-soldier serum. The episode also features a cameo by a group of street urchins who resemble the Newsboy Legion. The introduction features a Spy Smasher tale from World War II. Episode 9 ("Grudge Match,"	11 March 2006). Roulette is the villain. Episode 11 ("Ancient History,"	8 Feb. 2006). Hawkgirl and Hawkman relive past lives. This episode, written by Geoff Johns, was a 2-hour movie. Sylvester Pemberton—also known as Star-Spangled Kid—is killed by the Icicle, leading Chloe Sullivan and Clark Kent to investigate. They discover the secret history of the Justice Society of America, which was led by Hawkman. The JSA has been monitoring Clark and his super-hero friends. Dr. Fate, Sandman, and Stargirl (Sylvester's apprentice) join in to find the Icicle. Afterwards, Hawkman and Stargirl decide to seek out the remaining JSA members and their children, to help organize a new generation of superheroes. Carter Hall and Courtney Whitmore attend the surprise engagement party for Clark and Lois. The heroes come under attack by government officials (led by General Slade), whose Project Icarus is determined to bring in the "vigilantes." Carter Hall rescues Lois from Slade but takes a sword through his middle. The heroes bury Carter in Egypt, but they are knocked unconscious by an unknown object that emerges from Carter's burial chamber. Doctor Fate (Brent Stait), deceased: Worked with Hawkman and Stargirl in bringing Icicle ll down only to be killed by him to save John Jones' life. Mentioned his deceased wife, Inza. Hawkman (Michael Shanks), deceased: Leader of the team and Hawkgirl's husband. Sandman (Ken Lawson III), deceased: Was killed by Icicle II after having a vision of the Star-Spangled Kid's death. Stargirl (Britt Irvin): Pat Dugan's stepdaughter and the Star-Spangled Kid's protege. Star-Spangled Kid (Jim Shield), deceased: Fought Icicle II, and was killed by him after asking Chloe Sullivan for the Justice League's help. The Atom (Glenn Hoffman): Status unknown. Dr. Fate said, "the Atom split." The Flash (Billy Mitchell): Hawkman and Stargirl went looking for him. He started a school for gifted children in San Francisco. Green Lantern (Doug Pinton): Hawkman and Stargirl went looking for him. Red Tornado (Deborah Cole): Was arrested and released with the rest of the Society. Works in the brownstone. Wildcat (Roger Haskett): Hawkman and Stargirl went looking for him. Hawkgirl, deceased: Hawkman's wife; mentioned as having died in a battle against the original Icicle. Hourman: Dr. Fate said, "the clock stopped ticking for Hourman." Mister Terrific: Dr. Fate said he wasn't so "terrific" anymore. Stripesy: Mentioned as having been sidekick to the Star-Spangled Kid and step-father of Stargirl. In the comic book continuation of Smallville, there have been three Justice Society related story lines. Jay Garrick has made a return appearance, and the concept of Earth Two was introduced. Another major story features Director Bones of the D.E.O., Wonder Woman, and Hippolyta. Here however, Earth Two is combined with the concept of Earth Three, where Clark is the evil Ultraman. NOTE: The issue numbers hereunder are those of the digital issues, not the collected print issues. On Earth Two, Oliver and Chloe enact their plan to take down Ultraman. From Smallville Season 11 #38 (2013); art by Jorge Jiminez. Superman and Impuse locate retired Jay Garrick. From Smallville Season 11 #33 (2013); art by Jorge Jiminez. Director Bones and the D.E.O. Bones is mystically stripped of his skin. From Smallville Season 11 #61 (2013); art by Jorge Jiminez. Diana dons her mother's armor. From Smallville Season 11 #67 (2013); art by Jorge Jiminez. 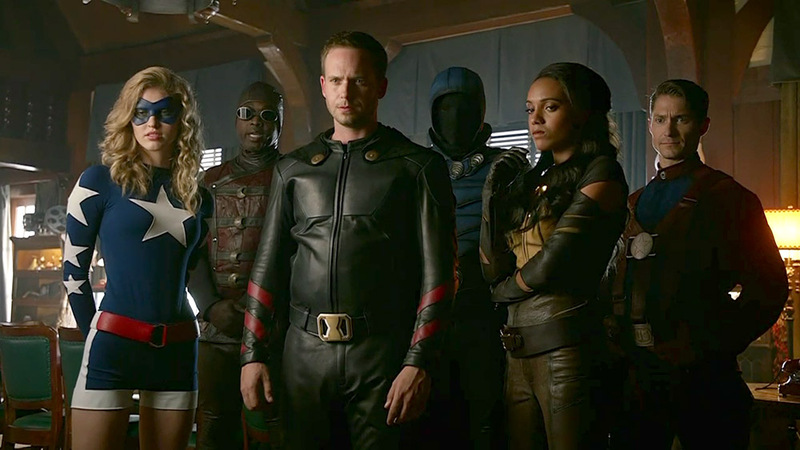 In Legends of Tomorrow, a team of heroes travels throughout time with the help of Rip Hunter. Naturally they would eventually encounter the JSA, right? Stargirl, Dr. Mid-Nite, Hourman, Obsidian, Vixen, and Commander Steel. From DC's Legends of Tomorrow, "The Justice Society of America" (2016). Season 2, Episode 1, "Out of Time" (13 October 2016). In 2016, historian Nate Heywood teams up with Heatwave to take the Waverider ship back to 1942 to prevent the Nazis from making a nuclear bomb, where they are confronted by the Justice Society of America (Commander Steel, Dr. Mid-Nite, Stargirl). Season 2, Episode 2, "The Justice Society of America" (20 October 2016). The Justice Society captures the Legends, believing them to be Nazi spies. Nate meets his own grandfather, Commander Steel. The fight with Baron Krieger and Eobard Thawne ends in Hourman's death. Also appearing: Dr. Mid-Nite, Stargirl, Obsidian, and Vixen.